One of the congenital flaws of the Windows operating system is the way it handles data (files&folders) on your hard drive. It simply breaks your files into pieces and writes those pieces to the handiest clear space it can find, which means that your files end up fragmented. The system can find those pieces whenever you want the data but eventually “stuff” gets spread out all over the drive. It takes more time to find, and everything begins to slow down. It takes longer and longer to boot the computer and the whole system becomes prey to such niceties as application lockups or freezes. We’ve all experienced that frustration. So defrag you must. It makes that machine that sometimes holds you captive—smoother, faster, and ever so less frustrating. It’s a simple bit of housekeeping whose benefits far outweighs the small amount of time and expense you invest in it. Windows provides a tool to deal with this creeping ennui, a tool to defragment your files and put all the pieces next to each other. 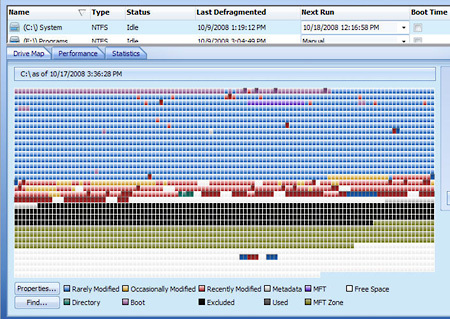 But even in XP and Vista, the Windows defragmenter is cumbersome, inefficient, and guess what—not very friendly. So as with many other problem-solving tools, there are worthy third-party developers who create solutions which do the job that Windows can’t. One of the most successful in the defrag world is Raxco and their PerfectDisk. Out of the box, PerfectDisk is straightforward and simple to use. If you employ it at “default”—the way it’s set to operate at installation it will do an efficient and hassle free job for you. You can defrag your drive(s) manually or you can place it on a schedule and almost forget it about it. It’s relatively fast and it can do its job in the background while you’re doing other tasks. And... you’ll see an immediate improvement in your computer’s speed and efficiency. That’s not to say that PerfectDisk is a basic tool that only satisfies basic needs. It’s much more than that. In fact, it’s one of the most comprehensive and powerful defragging tools available with an array of features to meet the requirements of the most demanding individual user and the complex, varied business environment. What I like most about PerfectDisk is its thoroughly tested installation process (quick and unobtrusive), an elegant, user-friendly interface, unusually good documentation (a rarity today) and responsive, personalized technical support (another rarity). 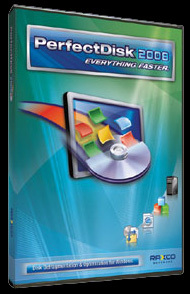 At $39.99 for the 2008 Professional version, PerfectDisk is a friendly, cost-efficient bargain to make your computing life just a wee bit more reasonable. A new user interface makes it easier than ever to use PerfectDisk. Menus and toolbars have been replaced with a ribbon that organizes and presents capabilities into a set of tabs that correspond to how the product is used. The tabs on the ribbon display the commands that are most relevant for each of the task areas in PerfectDisk. New wizards are also now included, providing easier setup. PerfectDisk now provides the ability to automatically perform defragmentation only when your system is idle. Together with the wide range of scheduling options available with AutoPilot Scheduling, PerfectDisk 2008 provides more flexibility, automation and complete control than any other disk defragmenter. PerfectDisk has been enhanced to run even faster during SMARTPlacement defragmentation passes. The engine also now uses 15% - 20% less memory consumption than PerfectDisk 2008, which results in additional improved performance. PerfectDisk's Single File Defrag has been replaced with Selected Files Defrag, giving users the ability to select multiple files to defragment, rather than the entire drive. The ability also now exists to select files from the "Most Fragmented Files" list for immediate and automatic defragmenting. A new graphical view of how fragmented your drive is. PerfectDisk 2008's powerful bit map display of disk drives is now enhanced with a new, colorful and easy-to-view circular graphic of your drive's level of fragmentation. PerfectDisk now provides the ability to easily and automatically reclaim valuable free space from your Recycle Bin, Temporary Internet Files, and duplicate text, picture, video and music files. See a bird's eye view of the space distribution between files and folders inside your drives' directories. 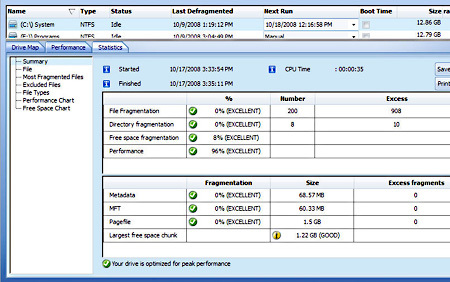 PerfectDisk 2008's Space Explorer also allows you to delete large files to recapture valuable space on your drive. Additional capabilities are now available through the system tray icon, providing additional ease-of-use. PerfectDisk now provides the estimated time of day when a defrag run will complete. Native support for 64-bit platforms provides improved performance and efficiency on 64-bit platforms. A new Active Directory tab is now available for those enterprises utilizing Active Directory, allowing for easy Active Directory snap-in and loading of the PerfectDisk 2008 Administrative template.